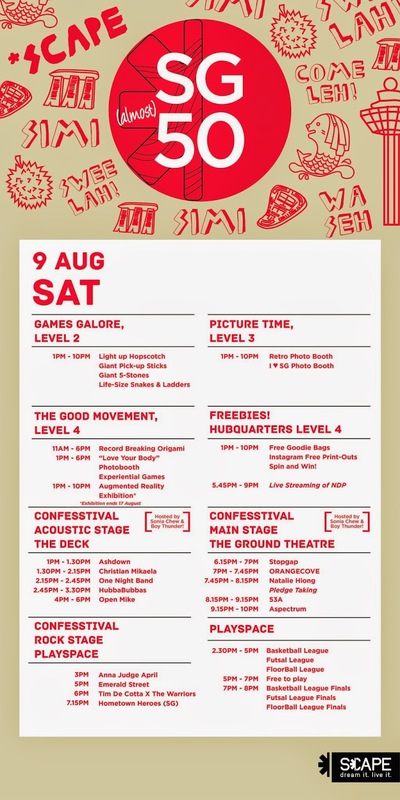 This National Day, youth talent and leadership development organisation *SCAPE is taking the indie pop anthem seriously with *SCAPE SG(almost)50, a National Day celebration with a youth-oriented twist. If you don't already know, *SCAPE Co. Ltd is a non-profit organisation with its mission and vision rooted in support of youth, talent and leadership development. The organisation aims to facilitate youth-oriented programmes and support within various communities of youth interest. The youth of today will be inspired and empowered to DREAM IT AND LIVE IT at *SCAPE! *SCAPE exists to serve and support youths to live their dreams and realise their full potentials. As the integrated talent and resource hub for young people in Singapore, *SCAPE offers a holistic network of programmes, communities, partners and facilities for youths to explore, create and strive. No dream is too small, no dream is too big. *SCAPE wants youths to be inspired to come forward and share their interests, share their dreams. Through guidance and facilitation, *SCAPE wants to see their dreams turn into ideas, and ideas into reality. Living their dreams should no longer be a dream at *SCAPE. *SCAPE’s strategic focus is in three core areas. First is to enable youth to live up to their full potential by supporting them in their areas of interest. Second, to provide the network and holistic ecosystem for youth development, both at *SCAPE and beyond. Third, to ensure the youth have the platforms and opportunities to express themselves through talent showcases and social participation. The four main areas of engagement are entrepreneurship, urban sports, visual & performing arts and community service. Come join us to play old-school, classic heritage Singaporean games from hopscotch and five-stones to pick-up sticks and snakes-and-ladders as they get upsized, updated and illuminated for a new generation. Putting the spotlight on youth talents and leaders in the fields of music, sport and community service, *SCAPE SG(almost)50 will feature local bands performing renditions of NDP songs, parkour workshops, basketball, futsal and floorball tournaments, as well as an augmented reality exhibition of youth-led community projects. Singer-songwriter Natalie Hiong will also be making a special appearance with her prizewinning song ‘I Keep Coming Back to You’, expressing the special place Singapore holds in many peoples’ hearts. The event will include live streaming of NDP 2014 and the taking of the Singapore Pledge for all Singaporeans present. *SCAPE SG(almost)50 is held on National Day 2014, across the five levels of *SCAPE and targeted to see 2,000 attendees and 50 volunteers. and join in the National Day celebration.